An Open Letter To Tyler Perry Tyler Perry's latest movie I Can Do Bad All by Myself opened in theaters Friday. Commentator Jamilah Lemieux wants the prolific TV and film producer to move beyond the stereotypical characters that have made him famous. 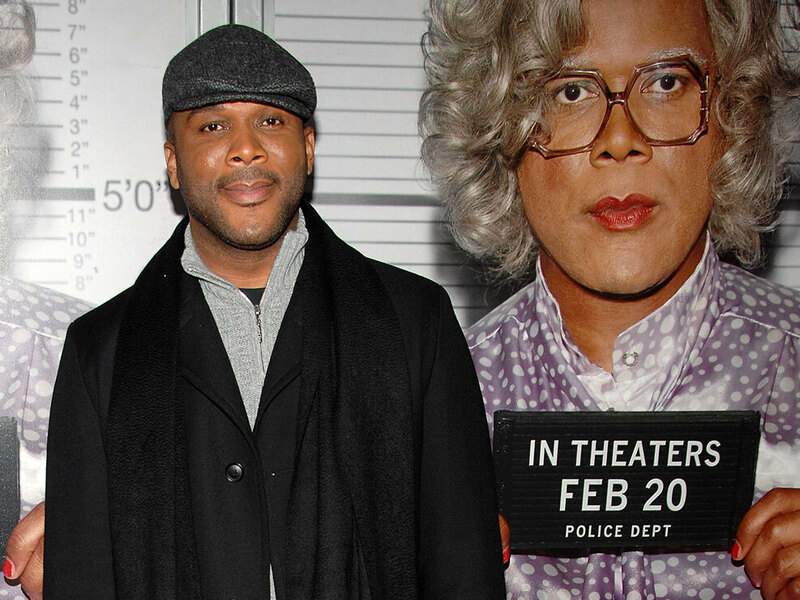 Tyler Perry attends the premiere of Tyler Perry's: Madea Goes to Jail in New York in February 2009. I appreciate your commitment to giving black folks jobs in front of and behind the camera. Your films are known for their humor, and they also have positive messages about self-worth, love and respect. For all of that, I thank you. However, my feelings about your work are conflicted. The images of black people we see in your movies and two TV shows, Meet The Browns and House Of Payne, are not always fair. Now, you are the only person who seems to be able to get black shows on TV. But both your shows are marked by old stereotypes of buffoonish, emasculated black men and crass, sassy black women. I'd like to support your work, I really would — because I'd like to see people who look like me on TV. But I can't let advertisers and networks think that these stereotypes are acceptable. Your most famous character, Medea, is a trash-talking, pistol-waving grandmother played by none other than you. Through her, the country has laughed at one of the most important members of the black community: Mother Dear, the beloved matriarch. I just can't quite get with seeing Mother Dear played by a 6-foot-3 man with prosthetic breasts flopping in the wind. Our mothers and grandmothers deserve much more than that. Heck, our fathers and grandfathers deserve more. Mr. Perry, you have told the Hollywood "old guard" to kiss your backside, and I appreciate that, brother. But many black folks have expressed some of the very same attitudes about your work that white critics have. Now, white filmmakers get chance after chance in Hollywood to try new things, no matter how many times they fail. We, however, have been fed the same images of ourselves over and over and over because they sell. But these images sell because there is nothing else. Mr. Perry, you are in a position now where, if you were willing, you could completely revolutionize the world of black film. You could singlehandedly develop the next crop of Tyler Perrys, Spike Lees and Julie Dashes if you want to. You have built an empire on a foundation of love and Christianity, Mr. Perry, but that is also mired with the worst black pathologies and stereotypes. I beg of you, stop dismissing the critics as haters and realize that black people need new stories and new storytellers. We don't need Medea anymore. I know you have more, because we are more and you are more. It's obvious that your fans will be loyal to you and support you no matter what. So do right by your people. I think you love us enough to do just that.